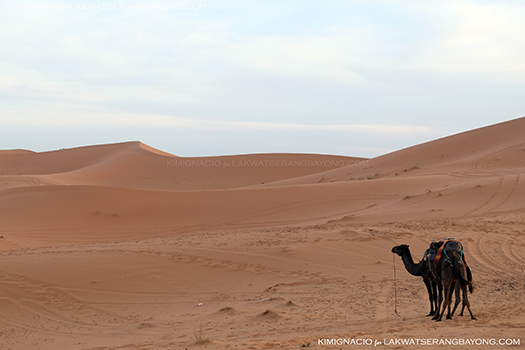 Enticed by the promise of fantastic views and a nomadic adventure, the second leg of our Morroco trip brought us to the Saharan desert. 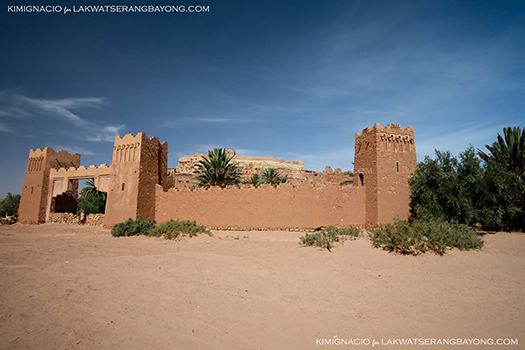 The trip from Marrakech to Merzouga for the Erg Chebbi sand dunes entails a lot of driving and planning the logistics is quite tedious and complicated. 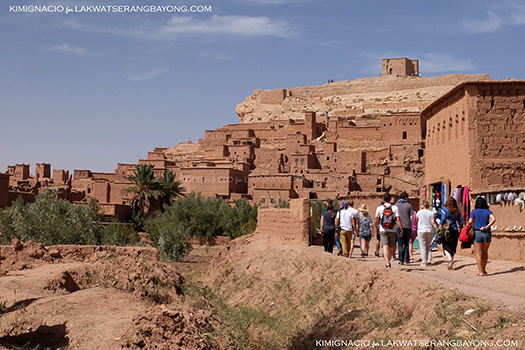 We found that it’s better to join a multiday package tour to break it up and we’re happy that the transport and accommodations were safe, comfortable and clean. There were also lots of interesting stops and side trips along the way and a chance to walk around and stretch our legs. Those were some of our main concerns and we’re glad our worries were unfounded. 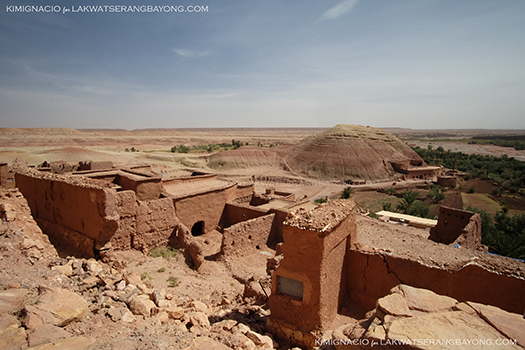 The 3 days/2 nights package tour we booked with our riad was a convenient way to see more of the countryside. 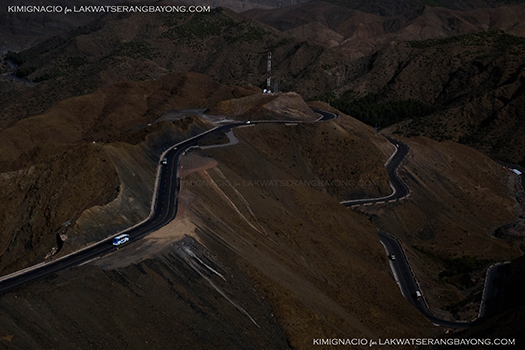 The drive was gorgeous as Morocco had such a contrasting varied landscapes. We were picked up at Riad El Jadide at 730 AM and was brought to the square where we then transferred to our official bus tour. We were supposed to do a private tour with just the 2 of us but there was a mix up in our riad and it was too late to change the booking so we grudgingly joined the group. The bus was a babel of languages with a merry mix of people from all over the world. Our group turned out fun and easy to get along with and we’ve met wonderful new friends. 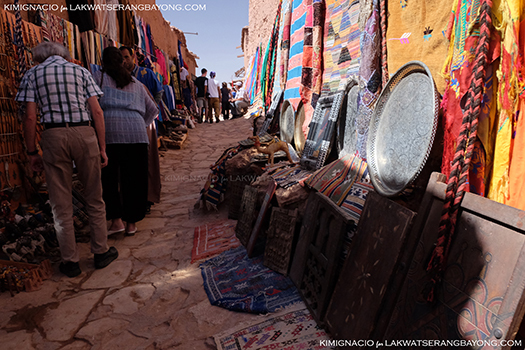 After exchanging emails and going on our separate ways after the Saharan Desert safari, we kept bumping into some of them at the other Moroccan cities and it was always wonderful to see a familiar face in a crowd. Looking back that was a fortunate mishap as we thoroughly enjoyed it although we probably can’t say the same for our guides and driver. During, we might have been the most difficult participants – always asking for lunch before exploring, sitting out hikes and sites when it gets too hot or cheesy, looks for the exits ahead of the others and leaves on our own. I hope our tip made up for it ha ha! Joining a group tour also came out very economical. 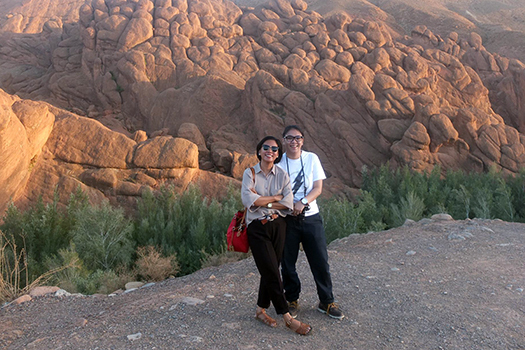 We departed Marrakech at 8 in the morning, 30 minutes behind schedule. 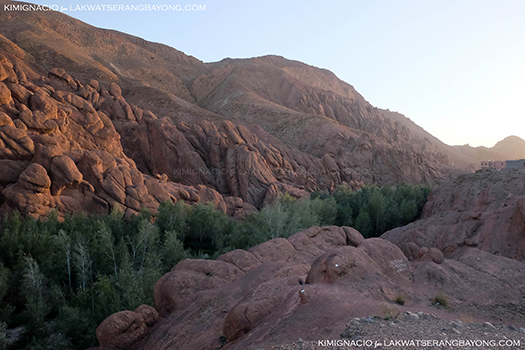 The stunning views begin immediately as we made our way up the High Atlas Mountains. We stopped for coffee and snacks at some roadside shack before crossing the extremely steep and winding Tizi n’ Tichka pass. Boy was I glad I haven’t forgotten to pack a whole pad of anti-emetic pill! 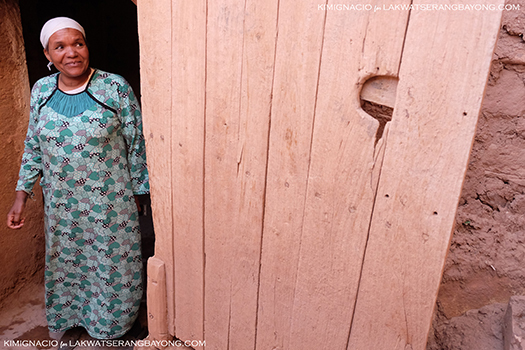 Before lunchtime, we’ve reached the province of Ourzazate. 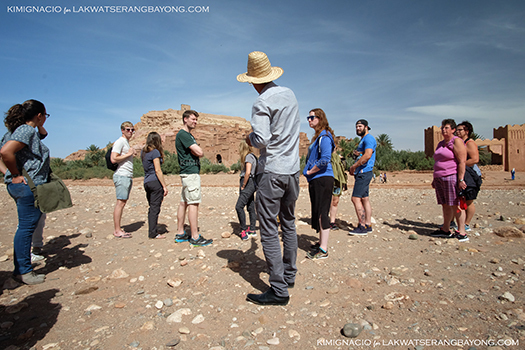 A guide (with a compulsory 25 MaD tip per person) joined us for a tour of the UNESCO World heritage site of Ait Benhaddou – a real fortified city. 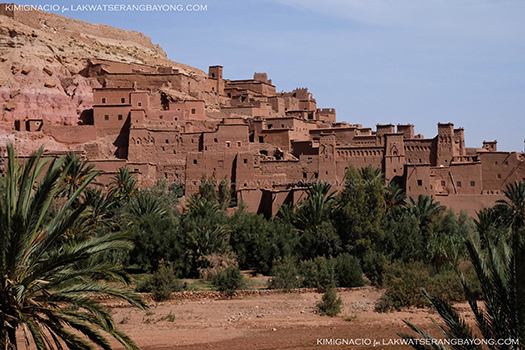 The Kasbah (fortress) was the slave trading city of Yunkai in that hit TV series Game of Thrones. Lunch (not included in the tour) was at a shaded terrace. I had beef tajine while Kim had chicken. Dessert was a platter of fruit and fresh dates. I wasn’t expecting much from the food as the place was packed with tourists but it was actually one of the best meals we’ve had in the country. It was then 2 PM and we were so hangry we couldn't be bothered to take photos. 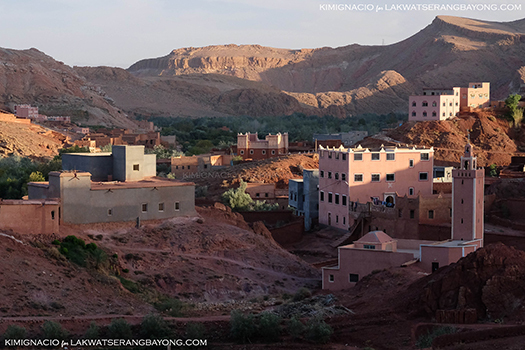 After a leisurely 2 hour lunch, we continued on with the drive to Dades Gorge stopping from time to time for coffee and tea, bathroom breaks or photos. Before dark, we’ve reached Le Veaux Chateau Du Dades where we stayed at on a freezing cold night. Dinner was a bowl of chunky soup spiced heavily with cumin followed with couscous and chicken tajine plus the ubiquitous chewy bread of course.